Any classes cancelled due to rain will be made up on another day. Any washouts will be made up as lessons. At Powells Creek Tennis Centre, we offer children’s classes after school, as well as school holiday clinics. After school classes include squads, group and private lessons on days and times that suit your child. Forget about paying for after school or holiday care: send them to Powells Creek Tennis Centre rain or shine. 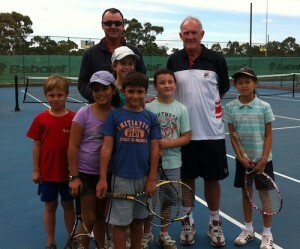 Brett Miners (the bloke on the left) has run successful junior tennis programs for over 25 years from Singleton to Sydney. He has coached at an elite level, and taught beginners from as young as 3 years of age, having developed a children’s program from scratch at Glebe.